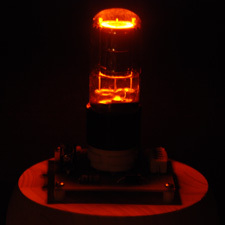 The Vacuum Tube Night Light uses a 1960s-era 0A3/VR-75 cold-cathode gas-discharge tube and a rectifying circuit to create a lamp that provides a soft, orange glow. A custom 3/32 inch thick FR-4 circuit board mounts to the top of a 2 1/4 inch round pine bun foot. The completed piece measures 4 1/2 inches in diameter and 6 1/2 inches high. It plugs into a standard 110VAC US power outlet. 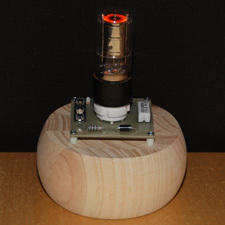 Based on the “Build a Novel Nightlight” article in the March 1995 issue of Popular Electronics. A kit version of this project is being designed for Crowd Supply. Sign up to receive updates and be notified when it launches.